The Scottish kilt knife (correct name Sgian Dubh) is traditionally worn tucked into the kilt hose of the right leg, mostly hidden in the sock with only the top of the handle being visible. However it is also perfectly correct for a left handed person to wear his in his left sock. The word Sgian Dubh (as a Scotsman I have to give it its proper name) comes from the Gaelic meaning "black knife" it is suggested the word black refers to the fact that centuries ago it was concealed in clothing, as a weapon of self-defence. Evidence suggests it would have been carried inside the upper sleeve of the jacket by Scotsmen in the early 17th and 18th centuries. 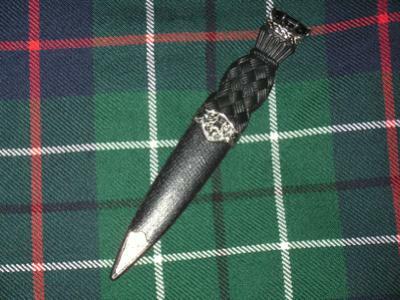 Etiquette demanded that when entering a friends home any and all concealed weapons would be revealed, the Sgian Dubh would then be taken out and placed in the top of the sock, held securely by the garter. Another possibility is that the word refers to the the black hardwood which is so often used in the making of the knife handle. it is an integral part of the full Highland Dress and is therefor an item worth giving a fair amount of thought to, before deciding which is the correct one for you. The choice is very wide, as are the prices, you can choose from a modern plastic hilt (the handle) to carved animal antler or a more traditional black wood. Clan Crests often adorn the hilt of the Sgian Dubh and you will usually find a semi -precious stone mounted on the hilt as further means of decoration. Originally the blades would have varied in construction, some having a "clipped" or "drop" point (made famous by the Bowie knife) but nowadays the "spear-point tip has become universally used. They are typically stamped from brass and nickel-plated. Some however are very expensive, being made from solid silver or Damascus steel. It is also fairly common to find the blades etched with family crests, Masonic and regimental symbols are widely used and having them custom made with your own design, is also an option. A modern Sgian Dubh is of course intended to be purely decorative, and as such is not normally used to cut, scalloped filework on the blade is common and a blade length of three to three and a half inches is normal. The scabbard although not seen as it is hidden in the sock, is typically reinforced with wood, and often has a decorative tip along with symbols and crests, making the Sgian Dubh overall more expensive than it would perhaps otherwise be. * Skene Dhu. * Skein Dubh. * Skean Dhu. * Skian Dubh. * Skene Du. However you choose to spell it, it is always pronounced "Skee(a)n doo"
It is important to note that no matter on what occasion you choose to wear your kilt, be it formal, or casual, the Sgian Dubh is almost always worn. One exception is when traveling by air, don't attempt to go through airport security wearing your Sgian Dubh, it will be confiscated. And wouldn't it be such a shame to loose your treasured kilt accessory! If you are traveling by air, and wearing your kilt, please pack your Sgian Dubh in your luggage, and not your hand luggage.